Home»At home»Have you got a message in a bottle? Have you got a message in a bottle? Message in a bottle keeps personal and medical details in a common location, where they can easily be found in an emergency. Do you have special medication or allergies? Message in a bottle could be a potential lifesaver. It could provide peace of mind, not just to you but to your family and friends as well. Do you live on your own? We would like to encourage everyone who lives alone to make sure their emergency contact and medical details are easy to find in the event of an emergency. 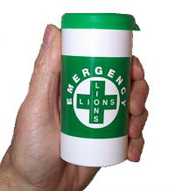 We are giving away the Lions Club free bottles for you to store important information, such as personal details, emergency contact details, Doctors details, medications and allergies.